Magna Interior Systems are a global tier 1 supplier to the automotive industry, with sites spanning 29 countries. Their vision is to deliver value to customers through innovative processes and world class manufacturing. The Magna factory at Hartlip, Kent identified a need to expand their production facilities to support the growth of their key OEM clients and commissioned a fully automated solution. 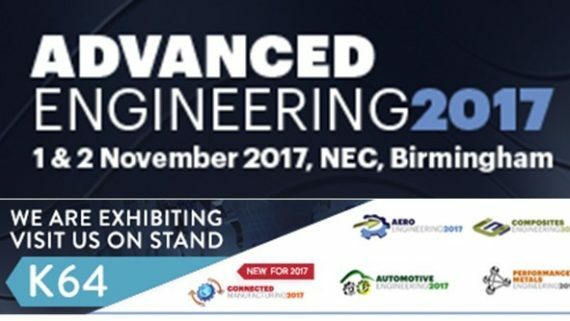 Junair were successful in securing the order based on a reputation of delivering innovation and state-of-the art, fully bespoke process systems. The aim of the project was to provide a state-of-the-art facility incorporating cutting edge technology to apply adhesive to upholstery used in the automotive industry. The brief required consistently top quality results ensuring the final finish of the vehicle interiors is high spec and premium quality. 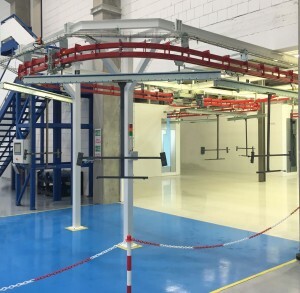 Not only have Junair achieved this, but as the factory only had a small area for the process to fit into, the whole process line was designed and installed on an exceptionally small footprint. 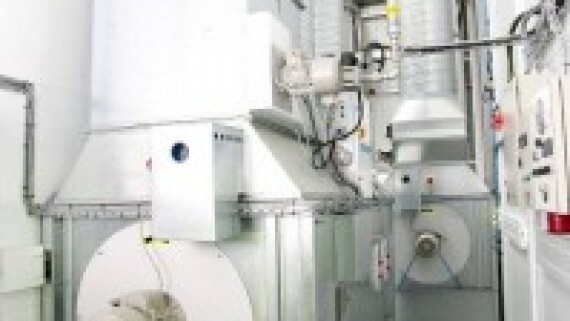 The entire facility was configured to allow optimum material flow into and out of the adjacent clients press facilities. The custom-made process line uses a sophisticated power and free overhead conveyor system, allowing specific details and information to be stored on RFID tags on each individual flight bar. The specific process details are entered onto a touch screen control panel which controls process routing and holds information such as process timings and product type. All options can be controlled and adjusted with the easy-to-use pre-programmed recipe system. The power and free conveyor allows maximum flexibility for the process ensuring the movement of the products is optimised for the process at any given stage. The client also had the benefit of two completely separate sets of work hangers to cater for different product groups. The product passes into a manual deionising area to ensure that they are free from any contaminants prior to moving on to the next stage of the process. Any contaminants on the product may hinder adhesion, or impact on the final quality of finish. 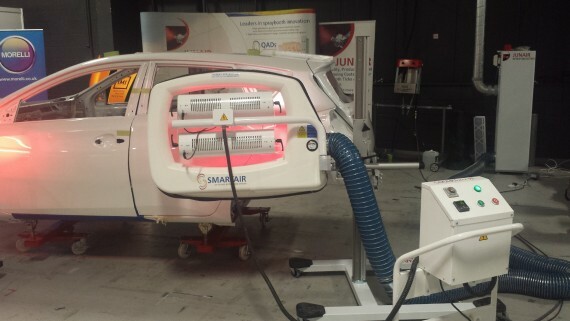 Once contaminant free, the upholstery is then passed through a fully enclosed spraybooth. A robotic adhesive spray application system using a bespoke adhesive pumping system is used to coat the product in adhesive, ensuring a uniform application. 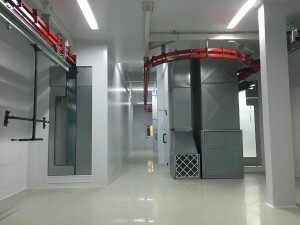 The spraybooth has a very high capacity exhaust overspray collection to ensure the maximum holding capacity, and hence, airflow stability in the process. The adhesive coated product is then passed through a cure oven to ensure the upholstery can be put in position with minimal fuss. The cure oven is temperature controlled and the dwell time in the oven is pre-programmed into the flight bars, ensuring consistency of the end product. Once curing has taken place, the products are then offloaded from the overhead conveyor. An adhesive pump room is situated adjacent to the process line, ensuring that the consistency of the adhesive is at an optimum level for product performance. Due to the tacky nature of adhesive, a specially engineered pump was required to ensure no clogging of materials within the process. Throughout the entire project, Junair worked in conjunction with Magna’s suppliers including robotics and conveyor manufacturers to ensure the smooth delivery of the process line with minimum disruption to the client. 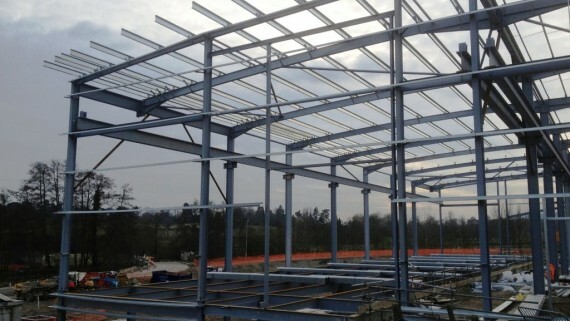 Junair’s Technical, Design and Installation teams worked closely with the client, understanding their needs and objectives, and ensuring all key requirements were met within budget and within an extremely tight timescale. For more information on Junair’s range of products. 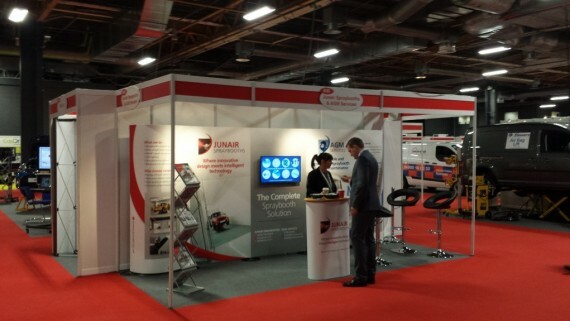 contact the experienced team on 01706 363 555 or e-mail sales@junair.co.uk. 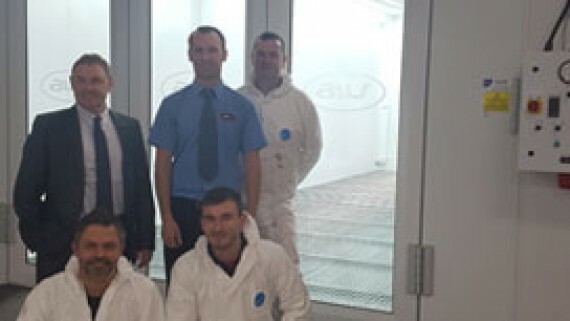 Our dedicated team of spraybooth manufacturers will be happy to help in any way we can. Junair Spraybooth’s Engineer Smells a Rat- Literally!